Let the good times roll at Bear Moon Lodge! With a hot tub, game room, and easy access, you might not want to leave. Bear Moon Lodge is centrally located for hiking, rafting, zip lining, and concerts at Harrahs Cherokee Casino. Find your perfect getaway at Bear Moon Lodge. With something for the entire family, this custom built upscale 3 Bedroom log home is easily accessible year round and just minutes from where you want to be. 3 Bedrooms & 2 Baths: The First Bedroom is upstairs and has a King size bed with a view and private bath. The bath has a tub and shower combination and dual sinks. The upper level also has a half bath. Watch your favorite shows on the Satellite TV or the DVD Player located in every room. Start your own billiards tournament in the game room with a custom log pool table. Local craftsmen lovingly constructed this pool table. If you don't feel like a game of pool, take advantage of the air hockey table or the board games at the side table. Listen to nature's symphony - bird song, cricket chirps, and the wind flowing through the trees. 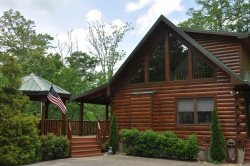 There's plenty of spots to enjoy the Smokies right at the cabin -- from the covered porch, to the hot tub, to the fire pit. Bear Moon Lodge wow where should I start. Everything was legatees from the mountains to the hills. Nice place lovely. This is an awesome place to come and relax and is conveniently located from the casino. Enjoyed every aspect of our stay. And the bachelor loved every moment. Thanks for letting us share memories in this lovely cabin. We love Bear Moon Lodge. We had a wonderful time. Everything was nice. Kids LOVED it!!! Thank you for allowing us to rent your beautiful Cabin. Maybe we will try to visit in the fall in a few years. My wife and I have been married for 9 years now and 2 of our 3 vacations have been here. What a wonderful life changing experience it has been. We love it here in the spring, maybe we will try to visit in the fall (just as the leaves are turning). I pray your stay will be as surreal as ours and we can not wait to return. What an awesome Cabin! My wife and I came here to celebrate our 12th year anniversary! Thanks for opening up your home for us to stay. We would love to come back again and soon. Everything was lovely. It did snow a little and we ere worried at first about getting out of the drive way but it turned out great. The roads were clear to drive so it was a pretty good stay with the right amount of snow to mare our stay even better.